I don’t know about you, but for me, the winter season always seems so busy! Perhaps it's the holidays and celebrations or maybe it’s all the activities, but winter is a super busy time of year...especially in the classroom. With so many tasks, activities and traditions in our "real" lives, it can be hard to find the time to plan lessons for students. That's why I thought I'd take one thing off your "to do" list: lesson planning! I've put together a round-up of winter-themed lessons and units that are just a download away from teaching. Some ideas are specific to holidays and others are perfect for any winter day! Make the busyness of the winter months a whole lot easier with the December and January virtual plan books. The FREE virtual plan books are designed to provide inspiration and ideas for making teaching and learning a whole lot more fun! You'll find lesson ideas and teaching tips & tricks for each month. And the best part? They’re free! If you’re looking for a discounted set of units for both months (which means you won’t have to plan a thing), check out the December Unit Bundle and the January Unit Bundle. Here are a few ideas that tap into students’ natural excitement about the winter holidays while keeping students learning! This is one of my favorite units to teach...especially in December! This 8-day drama study includes absolutely everything you'll need to teach the play. There's a traditional version and a version for interactive notebooks! Research has never been more fun or interactive with this Christmas Around the World project! Students each research a different country. Then, they turn their learning into fun and festive gift boxes. It's the perfect way to keep students learning this month! Tap into students’ natural excitement about the Christmas season with this fun, engaging, and super educational Reindeer Mail Mini-Unit! Filled with six activities that address critical ELA skills there is nothing “filler” about this unit! Check out these resources designed for the end-of-the-year. The reflection can be completed before students head off to break or when they return to school. And speaking of break, there’s a print-and-go resource for helping students learn over break too! As the calendar year draws to a close, engage your students with this fun, creative and FREE Personal Reflection and Infographic Activity. Students will complete a reflection on their year. Then, they'll turn the significant moments from 2017 into an infographic. This is perfect to do before break! Want to keep students learning while they are on winter break? It's easy with this Winter Break Project! The Tic-Tac-Snow Winter Break Project is filled with 9 learning activities that will have students reading, writing, and practicing critical thinking skills in unique and creative ways! Here are two sets of lessons that are built around the winter season! This brand-new resource is perfect to teach before the break or when students return to school in the new year. There's five winter-themed learning stations that target different reading comprehension skills. Students even create a fun flip book and "build" a snowman at each learning center! 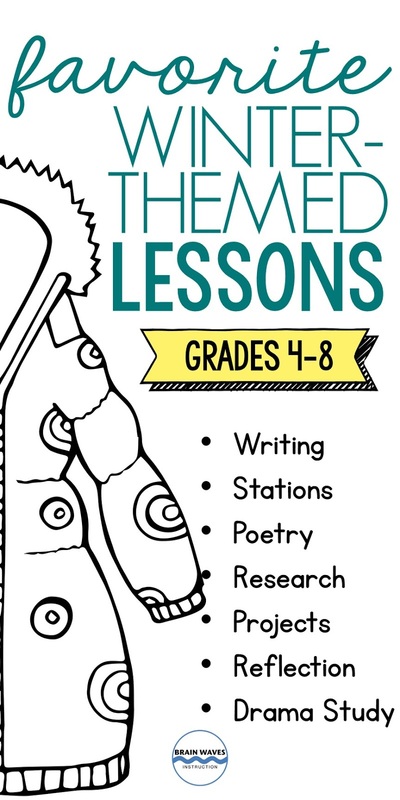 This winter, help students cozy up to five winter poems with this engaging 5-day poetry analysis unit. Take all the intimidation out of teaching and analyzing poetry with the interactive flip books designed for each poem. 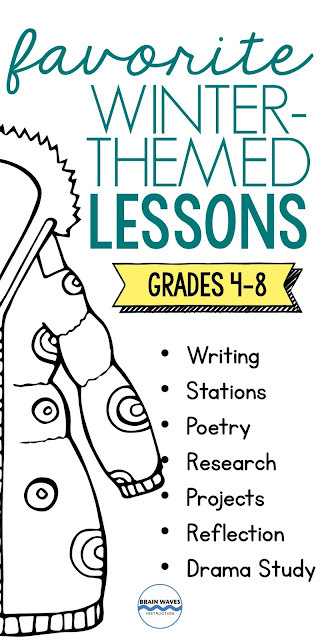 Each poem has a winter-theme and aligns with four analysis tasks. Speaking of poems, click here to find a set of Winter Poems that are perfect to read aloud! Here's a free writing lesson that you can teach on any winter day! In this fun lesson, students will write a myth based on a winter animal. They'll use spinners to generate ideas. Then, they'll complete a detailed pre-write to plan out their myths. Finally, they'll get writing and sharing! This free myth writing lesson works great all on its own, or you could easily leave this with a substitute teacher. Check it out HERE.